FxWirePro: What looks justifiable amid low IVs within G10 FX gamut on lingering Brexit? Delta-hedging or Safe-haven positioning? It was just another wild day for sterling and UK markets, as GBP’s sharp slumps yesterday tested the 1.3000 areas of support, before rebounding from there just as aggressively today. The underlying geopolitical barriers remain intact as the conclusion of the EU leaders’ summit last night essentially provided an unconditional two-week extension to the Brexit deadline to 12th April if the Withdrawal Agreement is not passed by the House of Commons next week. By that date, the UK will need to decide whether to accept a long extension to Article 50 and take part in European elections or to leave the EU with no deal. Should the House of Commons pass the deal, the UK will leave the EU on 22nd May (just before European elections take place), providing time for the deal to be ratified and ‘orderly’ withdrawal. While on a broader perspective, a breach below 1.30 indicates further price erosion within the range of 1.2440-1.3400 levels. Below 1.2440, the risk of a retest of the strong long-term support in the 1.21-1.20 area, should not be disregarded. Collectively, upon Brexit, US-Sino trade war, global recession risk, it would be easy to supplement the list of global risk factors. Subjectively, many people perceive that they are living in remarkably uncertain times. However, implied FX volatilities usually regarded as the market’s projection of the intensity of future FX moves recently dropped to extremely low levels. We admit there are exceptions. Implied GBP volatilities continued to trade at elevated levels due to Brexit risk. But even they fell recently and could not resist the apparently relaxed mood of the FX options market. Stripping GBP volatilities from Commerzbank’s FX volatility index reveals the exceptionality of the current situation. 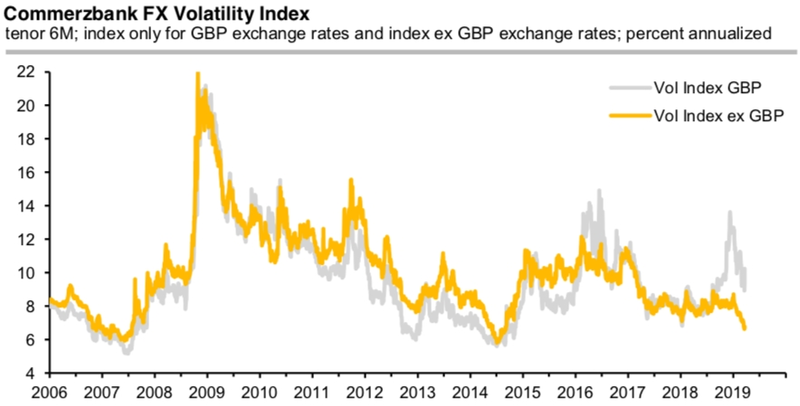 The Volatility Index (ex GBP) has fallen to values comparable to summer 2014 and spring 2007, the extremes in their index history. From the experience of 2007 and 2014, we can learn, however, that these episodes cannot last forever. The lower implied vols are trading, the more vulnerable is the market to jumps in exchange rates, which can hardly be compensated even be the cleverest delta-hedging strategies. Why? Low implied volatility means that delta-hedging of options positions requires higher adjustment frequencies. In market equilibrium, the fundamentally required exchange rate moves, therefore, have to happen at finer and finer time scales, otherwise, they are dampened by contrarian delta hedgers. But that was certainly not the underlying cause (as TRY weakness, e.g., started significantly earlier). It is reckoned that tonight’s jump in GBP risk reversals (a move that was certainly overdue, given the Brexit risks) served as a trigger starting an erosion of the low-vol environment. While hefty spikes in many spot FX rates this morning (refer 2ndand 3rdcharts) might be the stimulant under such market circumstances. Currency Strength Index: FxWirePro's hourly GBP spot index turns -66 (which is bearish), while the hourly USD spot index was at 25 (mildly bullish) at 12:11 GMT.